I first became aware of Bennett whilst visiting the library of the old Municipal Offices in Oldbury Road. I was fascinated by the detail in his History, and even more fascinated with the way the ‘Register and Magazine’ recorded details of people’s lives, births, marriages and deaths. It was providential, of course, that Bennett included such detail for the benefit of those who came after and who consult his books. In the early 1960’s I was talking to Phyllis Howells about Bennett. We bemoaned the fact that there was so little information about him, and, as we felt that he was worthy of some recognition from the present generation, we decided to do some research. We knew that Bennett had been buried in Tewkesbury, but did not know where. We consulted the records of the Abbey memorials, and came to the conclusion that the grave must be in the churchyard. At length Phyllis Howells found it reclining at an angle against the west wall of the Abbey. We were dismayed by its neglected look, and decided that at least the headstone ought to be straightened. I contacted the Tewkesbury Scout Troop to ask for assistance in putting it in order. Unfortunately, there was little enthusiasm for the project. Over a period of time we investigated further, and we discussed the possibility of a memorial within the Abbey. We felt that an engraved glass window, even a small one, could be placed there. The Vicar, whilst not actively discouraging the idea, was not enthusiastic. There were obstacles; ‘the Parochial Church Council would have to give permission, the Bishop and others would have to be consulted’, etc.,etc.. Inevitably, no memorial was raised, and I suppose that if we had pursued the idea more vigorously we might have had more success. There were further developments, however, as Mrs. Howells contacted Mrs. Susan M. Nuttall of Coventry, who was the great-great-great-grandniece of James Bennett. She told us of her “Uncle Gordon’, who was her father’s brother. 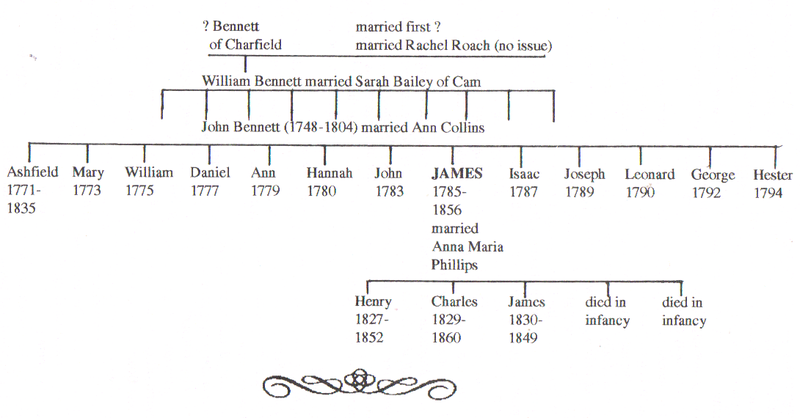 She enclosed a family tree, which showed that Gordon was the great-great-nephew of James Bennett. Gordon had attended a meeting held at the reopening of Tewkesbury Museum in 1961. He was apparently ‘an elderly gentleman of erect and stately bearing’, and he had learned something of his forebear’s life and work. He was, understandably. proud that his ancestor had been a Freeman of both Gloucester and Tewkesbury, surely a unique honour. He made himself known to Phyllis Howells, and she was thrilled and excited to meet a direct descendant of James Bennett. He subsequently told Phyllis that he remembered an aunt who had seen James in her youth, probably between 1840 and 1850; she described him as ‘a tall and courtly man, somewhat severe in appearance, but of a most kindly disposition'. James Bennett was born on May 10th, 1785 at Falfield in the parish of Thornbury in south Gloucestershire. He was one of thirteen children born to ‘yeoman farmer’ John Bennett, his mother being the daughter of John Collins, who was the occupier of the farm at Falfield Green. James was the eighth of the children, and he went to a school kept by a Mr. Daw at Stone, near Berkeley, where. astonishingly, he remained until he was fifteen years of age! For that period he had an extremely good education, far more than most, for this was at a time when most people could neither read nor write. From there he moved to Bath, where he was apprenticed to a Mr. George Robbins for seven years, as was usual at the time. Robbins was a printer and bookseller, but some time after James Bennett joined him he went out of business, and as a consequence the apprenticeship was transferred to a Mr. Meyler, then the proprietor and printer of the 'Bath Herald', 'to serve the remainder of his term of servitude'. At the end of the seven years, the young Mr. Bennett travelled to London, whether to sample the life of the city or to gain experience in his trade is not known, but he was employed by a Mr. Thomas Davison. printer, of Whitefriars. His stay in London was short, for in the same year, 1807, he returned to Gloucester. He joined the firm of the respected printer and publisher of the Gloucester Journal, Mr. David Walker, and for the next three or four years he conducted himself to the entire satisfaction of his employer. It was obviously during this period at Gloucester, with its connection with the Journal. that James Bennett acquired the experience, expertise and, of course, the connections which enabled him to set up on his own. It provided him with the accuracy in literary composition which marked all his works. In 1810 Bennett moved to Tewkesbury and commenced business as a printer and bookseller. continuing in business there until his retirement in 1852. Before then, in September 1818, he had been made a Freeman of the City of Gloucester on the proposition of the Mayor, Mr. David Walker. Astonishingly, this honour was surpassed in 1820 when he was admitted to the Freedom of the Borough of Tewkesbury, in recognition of his work as Director of the Poor. It is unlikely that this double honour has ever been matched or bettered, but it reflects the esteem in which he was held by his peers over a long period In today’s climate such service would surely have been recognised in the Honours List! In 1823 he married Miss Hannah Maria Phillips, the only daughter of Alderman John Phillips of Berkeley, where the marriage took place. His marriage to Hannah Phillips appears to have been one of great happiness. but unfortunately she died in 1840, “to the infinite grief' of her husband. They had five children; two died in infancy, two others died as young men, leaving only Charles James Bennett to outlive his father by two years, leaving no direct descendant. They are all buried together in the Abbey Churchyard. It is said that James Bennett’s sons were given a spartan upbringing, having to take an early morning plunge in the river! One can well imagine that this may have had some connection with their early deaths. 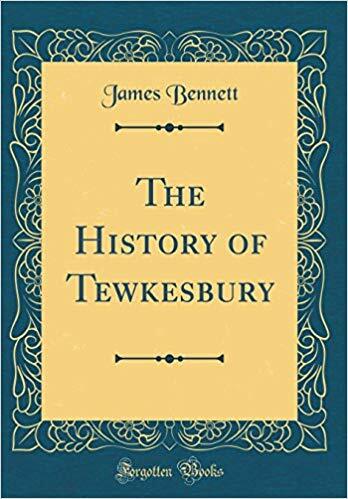 Early in 1830 Bennett published his ‘History of Tewkesbury’, a work much sought after by researchers of material relating to Tewkesbury, to such an extent that a second edition was published by Alan Sutton a few years ago. Bennett stated that he only undertook the work because he could find no-one else to do it. He was ideally placed to publish such a work, and even apologised for including so much detail! One can only wonder what gems he omitted, now gone for ever, or where his papers went. The Appendix to the History gives fascinating details of notable families who were involved in the development of Tewkesbury, the Dowdeswells, Codringtons, Traceys, etc.. There are several fine prints in the book, including a drawing of Telford's Bridge which was issued in 1828 as a separate print, a copy of which is held in the Museum. The description of the bridge for the History was written by Telford himself. In 1835 the book was condensed and published as 'A Sketch of the History of the Borough. An Account of the Battle and A Description of the Abbey Church’. The Foreword notes the abridgement and indicates that it was presented chiefly for the convenience of the strangers who visited the Abbey. It is highly unlikely that Bennett derived much income from the publications, as they are very specialised and localised, although over three hundred subscribers are listed at the end of the book. They ranged from local residents to people in St. Kitts in the Caribbean, and even the Solicitor General of Australia received a copy! It may be that Bennett, having published the History, had so much material left that he was induced to produce his ‘Tewkesbury Register and Magazine’ in periodical form, starting in 1830 and continuing until 1849. They were printed in blue paperback covers, and the author was fortunate recently to purchase a complete set, which are now bound. In the Gentleman’s Magazine in 1837 there appeared an article which, after detailing the advantages of a work of that description, stated that ‘this Register is altogether a model for the provincial satirist, at the same time that it is rendered agreeable by the further commenting that such publications should prove highly useful as affording authentic information for future historians.’ Prophetic indeed! James Bennett held several offices in the town; Councillor, Church Warden, Director of the Poor and Supervisor of the Local Board of Health during the cholera epidemic of 1832. However, Tewkesbury voters, then as now, had no respect for persons in authority, for in the local elections of 1835, the first under the Municipal Corporations Act, not one of the retiring Conservatives, including James Bennett, was re-elected. The town was shattered to learn that the Whigs had canvassed exceptionally well. A conscientious Councillor such as Bennett must have been dismayed to lose his seat to Reformists and Dissenters'. It seems to me that in an age of materialism and wealth-seeking, an age when honours appeared to be bestowed for political and financial support and for the merest acts of service, Bennett would have stood out like a shining beacon, meriting a much more significant memorial than a forgotten headstone in the Churchyard. Surely we as a group of amateur historians, who have much to thank him for, should try to right the situation and promote a suitable lasting memorial. Tewkesbury has been fortunate in having the services of a printer almost continuously from 1810 when Bennett set up business at 139, High Street. Isaac Jenner was the next printer to take up residence in the High Street, although there appears to be a gap between him and Bennett. In 1871 the business was bought by William North, who was one-time Head Reader at Spottswoode & Co., London. He was also a member of the Cordwainer’s Guild for some reason! R.A.Newman took over the business in 1921, although William North had died in 1907; perhaps his widow kept the business going during this period. When Newman died in 1962, John Greer, the MD. of Sutherlands, bought the business, bringing us up to date on an almost continuous run of printers from 1810.